Admit Cards have been issued/ dispatched by post to the eligible candidates, who have applied for the post of Jr. Asstt. (Grade-Ill) under Deputy Commissioner's amalgamated establishment, Nagaon for which the written examination will be held on 03.02.2019. 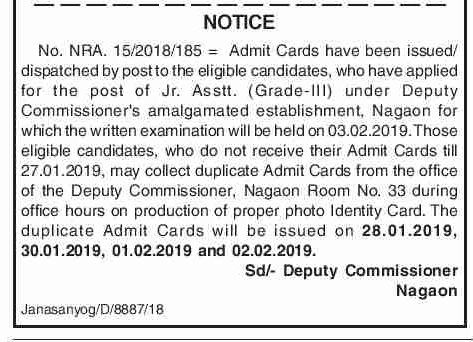 Those eligible candidates, who do not receive their Admit Cards till 27.01.2019, may collect duplicate Admit Cards from the office of the Deputy Commissioner, Nagaon Room No. 33 during office hours on production of proper photo Identity Card. The duplicate Admit Cards will be issued on 28.01.2019, 30.01.2019, 01.02.2019 and 02.02.2019.